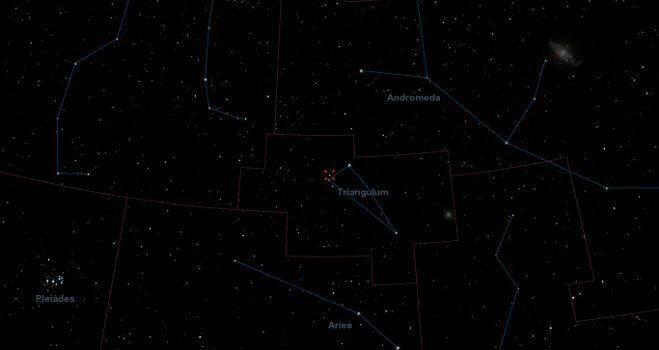 The primary sun of Delta Trianguli, Lilith, is a Sun-like yellow dwarf star, with a mass roughly nine percent greater than Earth's sun, and is about twelve percent brighter. The difference in light and radiation emitted is virtually negligible, and so differences in atmospheric optics for planets is nil. However, the same cannot be said for Lilith's stellar companion, Hades, which is significantly dimmer and less massive. Hades is an orange dwarf star of spectral type K3V, and as such, planets orbiting the pair at close range will have atmospheric optics moderately influenced by the second sun. This is due to Hades emitting light and radiation at different wavelengths, a result of its lower temperature. The color of chlorophyll in plants on worlds in the system's combined habitable zone may likely be influenced by Hades. 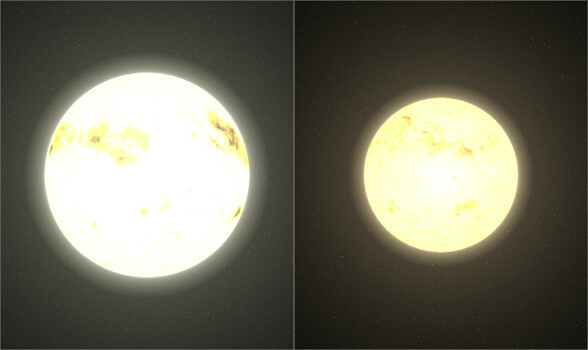 On the planet Belle Hades, the star appears as a dim, orange-red circle during sunsets, but is much brighter and appears white during the day. Although measurably dimmer than Lilith, the brightness differences are virtually imperceptible to the eyes of most humanoids. The stars revolve around their common center of mass, the barycenter, and since Hades is significantly less massive than Lilith, it orbits noticeably further from the barycenter than Lilith, and thus covers a larger amount of space than Lilith, as well as traveling faster in its orbit. A nice analogy is a see-saw in a playground; if you have two children of equal weight, they can sit on each seat at the same distance from the center, and thus the see-saw will be perfectly balanced and parallel with the ground; whereas if one child was heavier than the other, he or she would have to sit closer to the center of the see-saw in order to maintain balance. 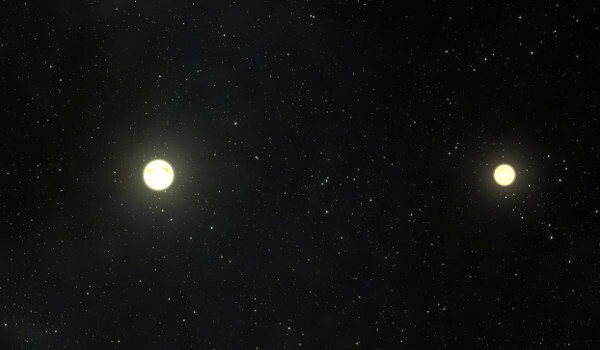 The image of the two suns together, above, illustrates this perfectly, with the center of the image being focused on the barycenter. When the system first formed, each sun had independent rotation, resulting in regular magnetic entanglements, which resulted in Hades undergoing frequent "super-flares," in which the K dwarf flared in a manner more closely resembling that of the super-flare of an M, or red, dwarf star. After approximately a billion years, Hades became tidally locked to Lilith, although it would take Lilith a few hundred million more to tide-lock to Hades. Fortunately, as a result of Lilith and Hades becoming mutually tide-locked due to their masses and proximity, the XUV, or "extreme ultraviolet" radiation, in the system plummeted, rendering Delta Trianguli quite favorable to the natural development of life; perhaps even more so than if Lilith had been a single star of the same mass and spectral type. Finally, as a result of the system's relatively young age, 1.9 billion years out of an expected 8.4 billion, both Lilith and Hades are considered "under-luminous", by Earthling standards. This is a result of a known component of stellar evolution, in which stars see steady, gradual increases in temperature and luminosity over the course of their main sequence lifetimes. By mid-life, they are approximately 1.43 times brighter than at the start of their main sequence phase. Lilith and Hades at maximum angular separation, as seen from the Habitable Zone. The field of view is 5° 23' 24.2" vertically. View centered on system barycenter. When Lilith begins the initial expansion into a red giant, it will grow large enough for Hades to begin capturing mass with its own gravitational field. Most of Lilith's excess mass will be transferred to Hades, which will still be in the main sequence phase. The new material will make Hades the more massive of the two, and decrease its own lifespan, as well as winding up with an orbit closer to Lilith, and likely a bit more eccentric as well, due to friction and other factors. Over the course of millions of years, Lilith will expand and contract repeatedly until most of its mass is either lost to space, or captured by Hades, and becomes a white dwarf. Unfortunately, the extreme ultra-violet light from the white dwarf will literally vaporize anything and everything too close to the pair; Belle Hades will be completely uninhabitable because of this. Eventually, Hades too, will end its main sequence phase, and expand into a red giant, at which point Lilith will be the one capturing material, triggering occasional novas, and will do so until the total mass of the white dwarf reaches 1.38 Solar masses, known as the Chandrasekhar Limit, and explodes as a Type Ia supernova. 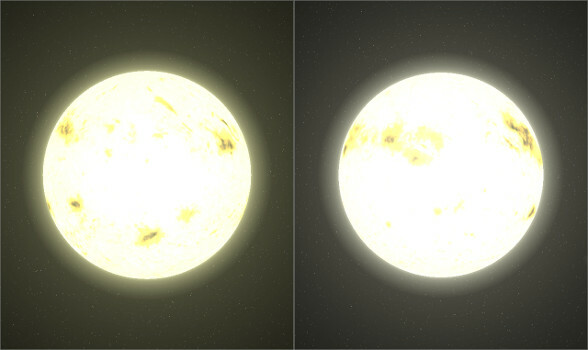 However, while the current total mass of the two stars is 1.84 Solar masses, exceeding the Chandrasekhar Limit for white dwarfs, which by itself could trigger a binary-induced supernova, the mass lost to space during each sun's red giant phase, through the material transfers, and/or from Lilith's extreme ultra-violet light during the white dwarf stage, could negate this fate, so it remains unclear whether either star actually goes supernova.